The 7th Infantry Regiment is an infantry regiment in the United States Army. In its 200-year history it has participated in 12 wars, been awarded 78 campaign streamers, and 14 unit decorations. The regiment has served in more campaigns than any other infantry unit in the United States Army. It is known as "The Cottonbalers" for its actions during the Battle of New Orleans, while under the command of Andrew Jackson, when soldiers of the 7th Infantry Regiment held positions behind a breastwork of cotton bales during the British attack. These actions and the lineage of other units that made up the 7th Infantry give the regiment campaign credit for the War of 1812. Shield: Per fess Argent and Azure, a fess embattled to chief Or masoned Sable between in chief a field gun Gules on a mount Vert and in base three bendlets sinister of the first. Crest: On a wreath of the colors (Argent and Azure), a cotton bale Argent banded Sable in front of the two bayonets in saltire Or. Motto: VOLENS ET POTENS (Willing and Able). Shield: The shield is white and blue, the old and present Infantry colors. The field gun is for the Battle of Cerro Gordo, where the 7th participated in the decisive attack by an assault on Telegraph Hill, a strongly fortified point. This portion of the shield is in Mexican colors—red, white and green. The wall is for the battle of Fredericksburg in which the Regiment held for twelve hours a position only eighty yards in front of a stone wall protecting the enemy. The base alludes to the shoulder sleeve insignia of the 3d Division with which the 7th Infantry served during World War I.
Crest: The cotton bale and bayonets in the crest are taken from the arms of the 7th Infantry adopted in 1912. Background: The coat of arms was originally approved on 5 July 1921. It was amended on 15 Oct 1923 to add a new crest. The Capture of El Caney : The 7th Regular Infantry, charging through the fields at the north of El Caney, are cutting their way through the wire fence. Major Corliss, who is prominent in the foreground of the picture, was at this time pierced through the shoulder by a Mauser bullet. For Howard Chandler Christy. 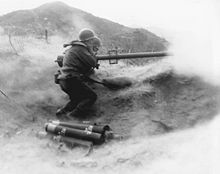 Recoilless rifle of 7th Infantry Regiment in Korea. The 7th Infantry Regiment, was originally constituted on 11 January 1812 in the Regular Army as a company of the 8th Infantry. was reorganized in preparation for the conflict with Great Britain which came to be known as the War of 1812. Since that time it has remained on duty in one form or another, making it one of the five oldest continuously-serving regiments in the United States Army. The regiment won 14 campaign streamers for actions during the Civil War. The Seventh Infantry regiment fought at El Caney and San Juan Hill. The regiment has been associated with the Third Infantry Division since that unit was established in World War I. The unit is credited with participation in the Aisne Defensive, the battle of Château-Thierry, the defense of the Champagne-Marne region and the attacks at Aisne-Marne, Meuse-Argonne, and St. Mihiel. During World War II, the regiment fought German forces on three fronts, North Africa, Italy, and Northwest Europe. It conducted four amphibious landings against beach defenses earning a spearhead device on the streamers awarded for these battles. In 1942, the regiment conducted an amphibious landing in Morocco. On 10 July 1943, the regiment made an amphibious assault at Licata, Operation Husky Mollarella, Poliscia, Torre di Gaffe e Rocca San Nicola beaches  starting the Allied invasion of Sicily. In 1944, it landed at Anzio, conducted a breakout and drove towards Rome. In August 1944, the regiment landed again, this time in Southern France as part of Operation Dragoon, advancing up the Rhone River to the German frontier. After fighting in the Vosges and in the Alsace at the Colmar Pocket the 7th crossed the Rhine into Germany. Taking part in the seizure of Munich it headed for Austria, reaching the Salzburg area in the waning days of the war. According to a HistoryNet article published in its World War II magazine, elements of the regiment serving under the 3rd Infantry Division commanded by Colonel John A. Heintges had the honor of capturing Hitler's retreat at Berchtesgaden. The same article argues it is quite probable no other regiment in the U.S. Army in World War II exceeded the 7th in combat time. After World War II the 7th Infantry Regiment remained a part of the 3rd Infantry Division. When the Korean War began in June 1950, the Seventh (7th) Infantry Regiment was located at Fort Devens, Massachusetts. Already at reduced strength, the regiment was further decimated when a battalion from Fort Devens was redesignated as the Third Battalion, Eighth Cavalry Regiment, and sent to Korea to join the First Cavalry Division. The 7th Regiment sailed from San Francisco, California, on 20 August 1950, and landed in Japan on 16 September 1950. There its strength was augmented by hundreds of KATUSA (Korean Augmentation to the U.S. Army—Korean conscripts detailed to serve with U.S. units). Two months later, the regiment embarked again and landed at Wonsan on Korea's eastern coast on 21 November 1950. It joined with the 15th and 65th Infantry Regiments and moved to the northwest of the Hungnam area where it covered vis-à-vis Task Force Dog from Chinhung-ni, the Army's X Corps forward elements (1st Marine Division and 7th Infantry Division Regimental Combat Team RCT 31 (AKA Task Force Faith)) withdrawal from the Chosin Reservoir and, joining the perimeter defense for the evacuation of Hungnam during the Chinese Communist Forces (CCF) Intervention. The 7th Regiment was the last unit off of Pink Beach at Hungnam and withdrew by sea on 24 December 1950; they moved into position north of Seoul as part of the Eighth U.S. Army's defensive line participating in the Chinese Communist Forces (CCF) April 1951 spring offensive. During the next two years, the regiment supported 3rd Division's combat operations in the Chorwon-Kumwha area, fought at the Jackson Heights and Arrowhead outposts, and blocked a CCF push in the Kumsong Area in July 1953. During eight campaigns on the Korean battlefield, the elements of the 7th Infantry were awarded Republic of Korea Presidential Unit Citations. In addition, the First Battalion, Seventh Infantry Regiment won a Distinguished Unit Citation for its bravery at Choksong, the Second Battalion for its bravery at Kowang-ni and the Third Battalion for bravery at Segok. During the Vietnam War, elements of the regiment were assigned to the 199th Infantry Brigade. Presently the regiment consists of mechanized infantry units equipped with the M-2 Bradley Fighting Vehicle, and a Light Infantry Battalion. 3rd Battalion, 7th Infantry, in 1973–75 was a maneuver battalion of the 197th Separate Infantry Brigade then reorganizing and training as the XVIII Airborne Corps heavy force element. The battalion, continuing to be organized as an infantry battalion in the early phase of the 197th Brigade's reorganization into a separate mechanized infantry brigade, performed a number of important missions for the Army during this period one of which was the support of the U. S. Army Infantry Board with a detachment of 69 then 49 soldiers from headquarters and A companies to conduct the Squad Automatic Weapons Developmental/Operational Tests 1 and 2 for four months. Subsequently, the battalion became an element of the 24th Infantry Division and later the battalion operated as a maneuver battalion (light infantry battalion) of 4th Infantry Brigade Combat Team, 3rd Infantry Division Ft. Stewart, Georgia. The 1st and 2nd Battalions and as already noted the 3rd Battalion were assigned to the 24th Mechanized Infantry Division (United States) at Fort Stewart, Georgia on 16 December 1987. Elements of all three battalions of the 7th Infantry Regiment saw action in the Persian Gulf as part of Operation Desert Storm, Kosovo and more recently Operation Iraqi Freedom. On 16 February 1996, the battalions were assigned to the 3rd Infantry Division. The 1st Battalion 7th Infantry Regiment and the 4th Battalion 7th Infantry Regiment (from Aschaffenburg, Germany) patrolled the Czechoslovakia border with Germany for years in preparation for war with The Soviet Union (USSR). They served during Operation(s) Desert Shield and Desert Storm, and both battalions of the regiment were to serve in the theater of operations. The battalions belonged to 3rd (Phantom) Brigade, 3rd Infantry Division. The brigade itself was a round-out brigade for the 1st Armored Division and served as "Old Ironsides" lead element 1st brigade. The 4th battalion consisted of 4 companies of the new M2-A2 Bradley Fighting Vehicles, of which three companies had some augmented mix of M1 Abrams tanks attached from the brigade's 4th Battalion-66th Armor Regiment. Only Bravo company 4/7 "Blackhawks" remained wholly infantry. It was the mission of Bravo Company to conduct urban and trench warfare for the battalion. Several regiment personnel received Silver and Bronze Stars with "V" devices for their actions during the ground war phase. Both 1/7 and 4/7 participated in the largest tank battle in US history: The Battle of Medina Ridge. The Battle of Medina Ridge was a decisive tank battle fought during the Gulf War on 27 February 1991, between the U.S. 1st Armored Division and the entrenched 2nd Brigade of the Iraqi Republican Guard Medina Luminous Division outside Basra. It is estimated more than 5,000 vehicles (A mix of tanks, armored fighting vehicles, armored transports, heavy & light trucks-shared by both sides) clashed during this particular engagement. The 1st Armored Division, commanded by Major General Ron Griffith, consisted of some 3,000 vehicles including 348 M1A1 Abrams tanks. The brunt of the fighting at Medina Ridge was conducted by the 3rd (Phantom) Brigade, 3rd Infantry Division which was the only brigade from the 3rd Infantry Division in the war. The brigade replaced 1st Armored Division's 1st Brigade and was commanded by Colonel James Riley. Medina Ridge was one of the few battles during Desert Storm in which American forces encountered significant Iraqi resistance and found it extremely difficult to advance. During the battle, American forces suffered one fatality (An M3 Bradley Scout driver - SPC Cash-from 4th Battalion, 66th Armor) due to friendly fire, while destroying 186 Iraqi tanks (mostly T-72Ms, Asad Babils, and Type 69s), and 127 armored vehicles. Only four Abrams tanks were hit by direct fire and disabled; none were destroyed. Upon returning from Iraq in May 1991, both battalions of the 7th Infantry Regiment and the rest of Phantom Brigade received orders to deactivate and draw down from Aschaffenburg, Germany. During the summer of 1992, 4/7 Infantry regiment closed its doors at Fiori Kaserne for the last time. During the Gulf War, two units of the 7th Infantry Regiment fell in the ranks of VII Corps. Corps normally command three divisions at full strength (other units such as artillery, corps-level engineers, and support units are attached as well). However, VII Corps had far more firepower under its command. 2/7 and 3/7 served with the 24th Infantry Division during the first gulf war, deploying from Fort Stewart Georgia, as part of the XVIII Airborne Corps. VII Corps' principal combat strength consisted of the following units: U.S. 1st & 3rd Armored Divisions, and U.S. 1st Infantry Division. In addition, the U.S. 2nd Cavalry Regiment (scout force), US 1st Cavalry Division, and British 1st Armored Division, as well as the U.S. 11th Aviation Group were attached for the operation. Both the 2nd and 3rd Battalions of the 7th Infantry Regiment assigned to 1st Brigade, 3rd Infantry Division participated in Operation Iraqi Freedom in 2003. During Operation Iraqi Freedom, the regiment's most notable achievements included seizing crossing sites over the Euphrates River and seizing the Iraqi regime's most prized possessions, Baghdad International Airport. SFC Paul Ray Smith, assigned to Company B, 11th Engineer Battalion, which directly supported 7th Infantry Regiment and was the first soldier awarded the Medal of Honor in the Global War on Terror for his actions in Iraq.They returned to Fort Stewart in September 2003. U.S. Army SPC Nate Acosta, assigned to the 1st Platoon, Bravo Company, 3rd Battalion, 7th Infantry Regiment, 4th Infantry Brigade Combat Team, 3rd Infantry Division, provides security near Forward Operating Base Shank, Afghanistan. The 3rd Battalion, 7th Infantry, was reassigned to the 4th Brigade Combat Team, 3rd Infantry Division in 2004, upon the creation of that new unit. Prior to that, the 3-7th Infantry had been assigned to the 1st Brigade, 3rd Infantry Division. This was a product of 3rd Infantry Division transforming to the new modular brigade concept after its return from Iraq in late 2003. 2-7th Infantry remained with the 1st Brigade Combat Team, while 3-7th Infantry joined the new 4th Brigade Combat Team. Delta Companies were also established in both 2nd and 3rd Battalions, designated as armor units and its infantry C Companies reorganized under 3-69 AR and 4-64 AR respectively while their C Companies moved under the infantry battalions to form combat arms battalions (CAB). Under transformation, E Companies were added from the 11th Engineer Battalion and forward support companies were added to support the CAB. After a tough train-up period during 2004, the reorganized 2nd and 3rd Battalions, 7th Infantry Regiment deployed to Iraq for Operation Iraqi Freedom III with their respective brigade combat teams (1st and 4th Brigade Combat Teams). 2-7 Infantry deployed to Iraq for a second tour in December 2004 until January 2006, to Saddam Hussien's hometown of Tikrit. The 3rd Battalion assumed responsibility of Western Rashid in Baghdad, an area encompassing more than 800,000 Iraqis. The 7th Infantry Regiment's most notable achievement was ensuring the security of over 100 polling sites during two Iraqi national elections. In January 2007, 2-7 Infantry deployed to Iraq for a third, 15-month tour. The unit served in Anbar Province, the largest province in Iraq, under the command and control of Multi-National Forces West. TF 2-7 deployed to Hīt, with Company C, 2-7 IN attached to TF 3-69 AR (Speed and Power) in south-central Ar Ramadi. Cold Steel was instrumental, with its Iraqi Army and Police partners in bringing peace and stability to Ramadi during the Anbar Awakening. The 2nd Battalion redeployed in April 2008. In 2007 the 4th Brigade, 3rd Infantry Division was alerted for deployment to Iraq as part of Operation Iraqi Freedom in late 2007. 3-7 Infantry became critical to the success of the surge ordered by President Bush. Numerous Operations were conducted, and most notably Operation Marne Avalanche. One AO in particular (Wasit Provence) was controlled by a single armor platoon of 16 men and was the largest AO in Iraq. The 4th Brigade, including the 3-7th Infantry, continued to serve in that country into 2008. In December 2009, 2-7 Infantry deployed to Iraq for a fourth time as an advise and assist battalion. B-Co. 2-7 was located south of Baghdad in the town of Mahmudiyah. From July 2010 to July 2011, 3-7 Infantry deployed to Ar Ramadi with the 4th Infantry Brigade Combat Team in support of Operation Iraqi Freedom and Operation New Dawn, with Attack Company providing Advise and Assist to the Iraqi Army at al Taqqaddum. After the new year, the Cottonbalers moved to al Asad Airbase where they provided training to the Iraqi Army before redeploying to a brand new Light Infantry Brigade facility at Fort Stewart, GA.
From September 2012 to May 2013, 2/7 Infantry deployed to numerous locations in some of the most rugged and hostile areas throughout Afghanistan as part of a Combined Joint Special Operations task force. The Battalion returned to Fort Stewart, GA at the end of this deployment. In March 2013, 3/7 Infantry deployed to Logar Province, Afghanistan as division reserve force at Forward Operating Base Shank. They returned to the stated at the end of the year. There was a 7th Infantry Regiment raised for the 1798 Quasi-War with France. It was mustered out without seeing active service. Another 7th Infantry Regiment was raised in April 1808, and saw service in the War of 1812. During the 1815 postwar reduction in force it was consolidated into the 1st Infantry Regiment. It was this regiment that fought at New Orleans in 1815. The official lineage followed the 8th Regiment after the war. This article incorporates public domain material from the United States Army Center of Military History document "Lineage and Honors - 7th Infantry". ^ a b c "Seventh Infantry Regiment (Cottonbalers)". WarChronicle.com. Archived from the original on 18 July 2011. Retrieved 19 October 2012. ^ "Wayback Machine". archive.org. 11 September 2006. Retrieved 22 April 2018. ^ John Pike. "2-7th Inf at Global Security.org". Globalsecurity.org. Retrieved 19 October 2012. ^ "The Seventh Infantry Regiment Association". Cottonbalers.com. Retrieved 19 October 2012. ^ "American-Divisions.com - Husky Operations Plan Sicily". www.american-divisions.com. Retrieved 22 April 2018. ^ Cowart, Glenn C. (1992). Miracle In Korea: The Evacuation of X Corps from the Hungnam Beachhead. Columbia: University of South Carolina Press. ^ "US Army National Infantry Museum". army.mil. Retrieved 22 April 2018. ^ "3rd ID 'Cottonbalers' complete mission in eastern Afghanistan". army.mil. Retrieved 22 April 2018. Wikimedia Commons has media related to 7th Infantry Regiment (United States). "Lineage And Honors Information; 7th Infantry (Cottonbalers)". United States Army Center of Military History. 2 June 1997. Retrieved 31 October 2008. "Medal of Honor Citations". United States Army Center of Military History. Archived from the original on 1 November 2008. Retrieved 31 October 2008.